In the 1890s there was a small Baptist church in Mayfield County, Kentucky. The church had two deacons who were constantly arguing and bickering over some issue or the other. 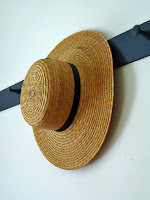 One of them put up a small wooden peg on the back wall so the pastor could hang up his hat. When the other deacon discovered the peg, he was outraged. “How dare you put a peg in the wall without first consulting me!” The people in the church took sides and the congregation eventually split. Today the residents of Mayfield County still refer to the two churches as Peg Baptist Church and Anti-Peg Baptist Church. For the record, we’re neither Peg-ite nor Anti-Pegite; we’re Non-Peg-ite, just as the Bible teaches! But before we get too smug, we need to remember that we have something of a history of division in our churches, maybe over things just as silly. At the same time the Peg-ite and Anti-Pegite controversy raged in Mayfield, our churches were splitting over the use of instrumental music in worship and how missionaries could be and should be supported. We have divided over how many cups can be used in communion and how many Bible classes are permitted. We have divided over what we believe will happen at the end of time (rather than just waiting to find out). We’ve even divided over whether or not we should pay preachers! Heretics! Maybe the world looks at Christ’s church and poorly we get along with each other and has decided that this “ministry of reconciliation” stuff just doesn’t work very well!